Custom Golf Clubs Travel Bags Personalized in Bulk. Promotional, Economy. Lowest prices in the USA and Canada. Bulk golf clubs bag covers on wheels feature foam-padded top to protect club heads, carry handle, top pull handle, and exterior zippered shoe pocket, 50" x 16 1/2" x 8 1/2" (16 1/2" diameter bottom). Free artwork design. Budget Prices in the USA, Canada for wholesale personalized golf bags covers. Imprint Area: 7" x 7" . Embroidery Area: 6 3/4" Diameter. 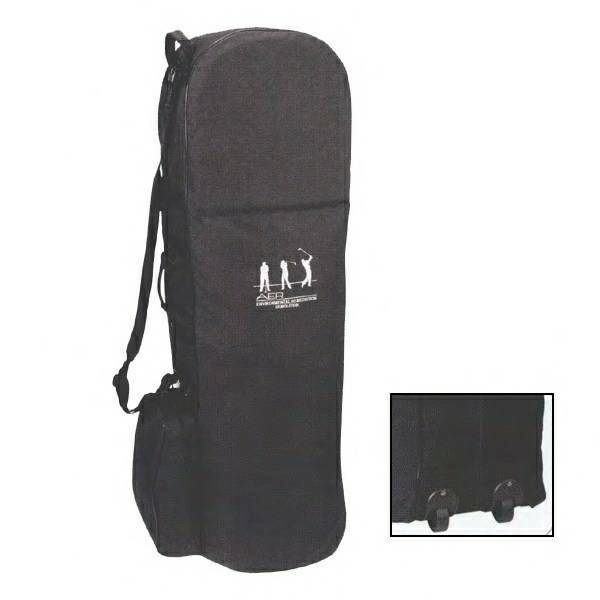 Product Weight: 6 golf clubs bags covers per case of 35 lbs. Production Time: 5 days from art approval on a 1 color imprint, 6 days for multi-color imprints, and 10 days for embroidered golf clubs bags. SIZE: 50" x 16 1/2" x 8 1/2"